Finte O’Broin is a not for profit organisation which aims to promote and foster all the interests of the O’Byrne Clans of Leinster, it’s members in Ireland and throughout the world. The Clan shall uphold and maintain the history of the O’Byrne Clans of Leinster, and other clans and families of that surname and its variations in Ireland. The Clan also aims to promote kinship and friendship among all of the name and their descendants. Finte O’Broin will promote the history and identity of all those who bear the name O’Byrne or any of its variations. It will provide a central point of reference in Ireland for all of its members. It will maintain historical information and produce information on clan business and events. Finte O’Broin will organise and facilitate regular clan gatherings in Ireland and abroad to promote the existence of the clans and families associated with the surname. Finte O’Broin will bring together all O’Byrne’s in Ireland and across the world in a common interest and sense of identity. It will promote this sense of identity within a framework of humanity, equality and fairness. Finte O’Broin will consist of a central committee (Derbfine) with an office based in Ireland and individual chapters throughout the world. There should be a total of at least11 members on the Central Committee at any one time and no more than 15. Each hereditary family should elect a member to represent them on the central committee and to act as “Guardian of the Name”. Only representatives of the hereditary families can hold the office of President of Finte O’Broin. Hereditary families are those families who can trace their family pedigree to one of the royal or ancient chieftains of Clan O’Byrne of Leinster. It is our aim that hereditary families should have their pedigree registered with The Office of The Chief Herald of Ireland. The current Patron of Finte O’Broin is Lt. Col. Charles Artaud Byrne, O’Byrne of Ranelagh (Guardian of the Name) and Best Claim Hereditary Chief of the Name. The Patron of this award is Lt.-Col. Charles Artaud Byrne, O’Byrne and Lord of Gabhail Ragnall. The Keeper of the Order is Derek Byrne, O’Byrne of Downes. The Raven Medal of Merit is awarded to those who bring dignity and honour to the Byrne name. The award was established on the 1st of January 2012 and was presented to five members of the Clan organisation in honour of their charity work and for establishing Finte O’Broin, the International Society of Byrne Clans. The name of this organisation shall be Finte O’Broin, and shall include all those with a DNA link to the Byrne Clans of Leinster and beyond. The aim of the organisation is to promote and foster all the interests of the O’Byrne Clans of Leinster at home in Ireland, overseas and around the world. To promote and foster kinship, friendship and camaraderie among all of the name and their descendants. To establish and maintain an Executive Secretary Office, as a central point for communications for all members throughout the world. To create communications among members by collecting, distributing, and publishing information about all aspects of the association. To research and maintain an archive of materials relating to the O’Byrne Clans of Leinster and their ancestors for the use of Chapter members, including conducting, promoting or assisting research work into O’Byrne Clans of Leinster History. To develop and maintain a library and database for the use of clan members in tracing their ancestry and family history. To identify, mark, and preserve the historical and archaeological sites, treasures, and events relating to the clan, including graves, castles, ancient sites and residences of ancestors. To bring members together at periodic gatherings at the Ancestral Homelands in Ireland. To publish An Annual Clan Journal, periodic newsletters, books, and other pertinent literature and create communication with the public, industry and governments, to inform and educate the same about the history, culture and traditions of the O’Byrne Clans of Leinster. The Officers of Finte O’Broin are the Executive Committee(Derbfine) and should be elected from the membership. President: The President shall be the presiding officer of the Executive Committee. In the absence of the President, the Vice-President shall preside over the meeting. Executive Secretary: The Executive Secretary shall be responsible for the keeping of Chapter membership records, notifying the membership and recording minutes of all meetings. The Executive Secretary’s office shall be the communication and coordination centre for the Chapter, shall prepare and present a summary of Chapter activities at the Annual Meeting. Treasurer: The Treasurer shall be responsible for the collection, distribution and accounting of the Chapter funds and shall prepare and present a full account summary at the Annual Meeting. Public Relations Officer: The P.R.O. shall prepare or assist in the preparation and distribution of media notices and releases, as directed by the Executive Committee. Historian: The Historian shall be responsible for the research and preservation of the Association History. Genealogist: The Genealogists shall be responsible for the creation and maintenance of Family History records and assist members in tracing their ancestry. The Executive Committee shall consist of the above Officers plus additional members elected at Annual Meeting making a total of at least 11 but no more than 15. In some cases a “Blood-Line” or “Honorary” Chief will be available to serve as Chief of the Clan/Name. The “Blood-Line” Chieftain for the O’Byrne Clans of Leinster is divided into the two houses of Crioch Brannach and Gabhail Raghnall. The current “Best Claim” hereditary Chiefs are Lt-Col. Charles Artuad Byrne (Ranalagh) and Count Henri O’Byrne (Crioch Brannach). Finte O’Broin also recognizes those representatives from the four “Hereditary Houses” of Croich Brannach as honorary “Guardians of the Name”. The four Hereditary houses are O’Byrne of Newrath, Downes, Kiltimon and Croneroe. Membership of Finte O’Broin and all Byrne Clans shall be open to all individuals who agree to abide by the Articles of Association. Their will be “NO” annual membership fees. 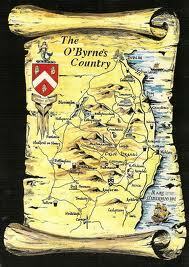 Members with the O’Byrne surname (or variations) and descendants thereof, are already members by right of heritage. Membership is defined as an individual member or as a husband and wife and all children under the age of 18 years. Such a membership shall have one vote. Members “are” life members. All members will have full rights and privileges. All members of good standing may seek election to the Executive Committee. All meetings will be established by the Executive Committee. All Executive Officers and Committee shall be elected at the Annual Meeting. All registered members may seek nomination to the Executive Committee and nomination must reach Executive secretary at least 30 days prior to the Annual Meeting to enable postal or proxy votes to be requested. Only registered members may vote. All nominations, motions, resolutions, referenda and/or other business to be acted upon, must be submitted to the Executive Secretary at least 30 days prior to the Annual Meeting, to be prepared in an agenda. Any item of business submitted must include name and signature of a registered member. Any proposed changes to the Articles of Association must be submitted for consideration and can only be voted on at the Annual Meeting. Executive Committee meetings may be held at other times at the direction of the President. All registered members are entitled to vote on all items of business brought before the annual meeting and all matters submitted to the membership for vote by postal ballot. Postal and proxy votes will be accepted if submitted in writing 14 days prior to meeting. Voting for the Office of “President” is decided by the representatives of the four hereditary houses. All motions, resolutions, referenda and/or other items of business properly submitted for the agenda will require a simple majority vote to pass. There are those individuals who by their actions, labors or deeds, contribute to the advancement of the goals of the Clan or family name. The Clan may acknowledge such persons by conferring upon them such honors as committee deems fitting e.g. The Raven Medal of Merit. 1. Such action involved the commitment of a crime. 2. Where such action was taken to expressly cause damage to the reputation or property of the Clan or its members. 3. Where an individual having custody of the property of the Clan fails to deliver such property when directed by the Executive Committee. All property, purchased, produced, or gifted shall be the property of the Clan. In the event the Clan ceases to exist, all funds, property, and assets will be re-assigned, at the discretion of the Executive Committee. Article 11 – Election of Guardians of the Name. Candidates for the position of Guardian of the Name must be members of the Hereditary Family concerned. It is up to the hereditary families to decide themselves on their nominated representatives. The office of Guardian of the Name is open to female members of the family.